Over time, both the vineyards and restaurants of the Valle de Guadalupe region in Baja have thrived, drawing enthusiastic customers and critical successes. 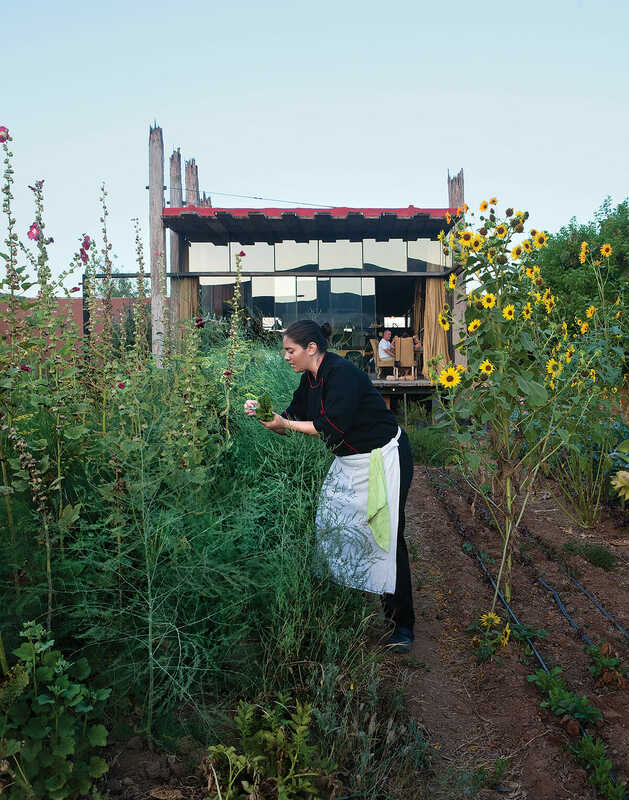 A chef at CorazÁ³n de Tierra selects eneldo (dill) sprigs from the orchard. The hills of northern Baja are covered in shrubs and strewn with massive, misshapen boulders, giving them a harsh, otherworldly beauty. It’s an unexpected setting for one of the newest and most intriguing wine regions in the Americas. 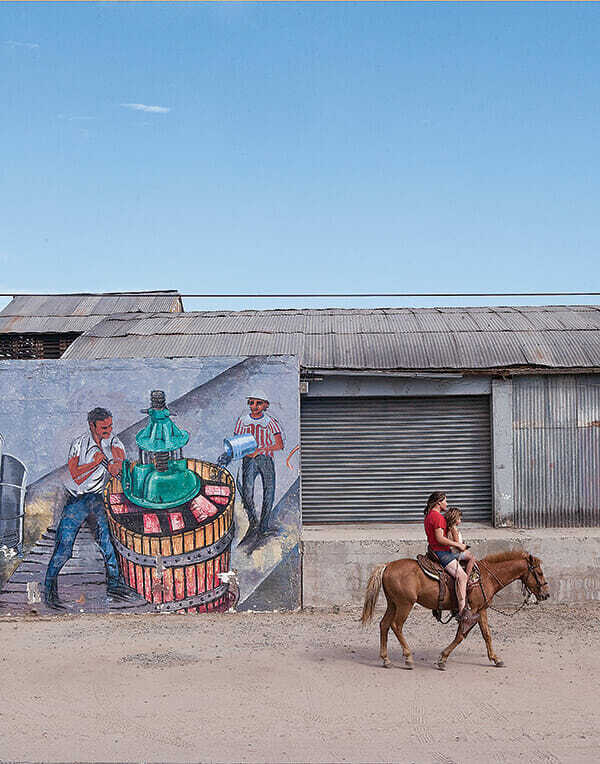 In recent decades, the Valle de Guadalupe region has gone from producing a handful of mediocre wines (the remnants of a faded industry that began a century ago) to having more than 60 wineries and many respected winemakers. As often happens, chefs have followed the vines. Drawn by a Mediterranean climate that offers a rare range and quality of ingredients – including grass-fed beef, olive oil, fresh seafood and tropical fruit – they built creative, ambitious restaurants surrounded by farmland at the end of dusty dirt roads. Over time, both the vineyards and restaurants thrived, drawing enthusiastic customers and critical successes. On the 75-acre La Villa del Valle estate, the restaurant CorazÁ³n de Tierra (“Heart of the Land”) is a minimalist steel structure with floor-to-ceiling sliding glass windows that open onto expansive gardens, where artichokes bloom with purple flowers, sunflowers grow head-high and rows of lavender run between olive trees. The charismatic young chef, Diego Hernandez, is an Ensenada native who insists that all the produce used in his ever-changing six-course tasting menu is sourced entirely from the estate. 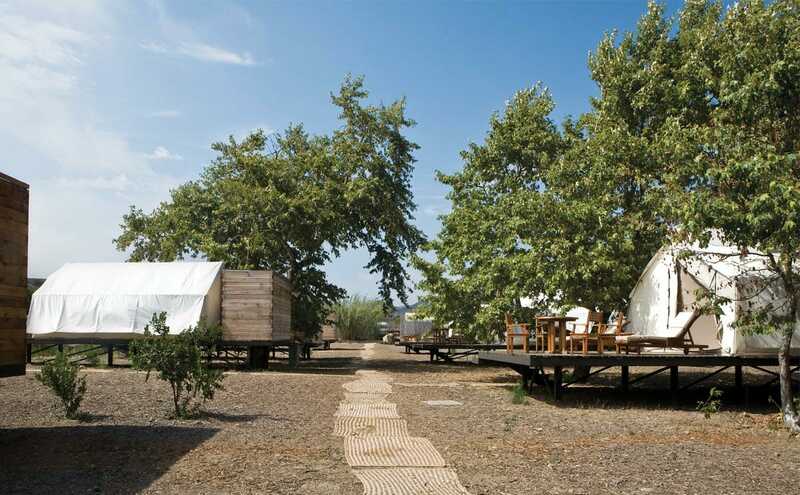 The property also presses the only organic olive oil in the valley and makes a line of lavender-scented bath products. 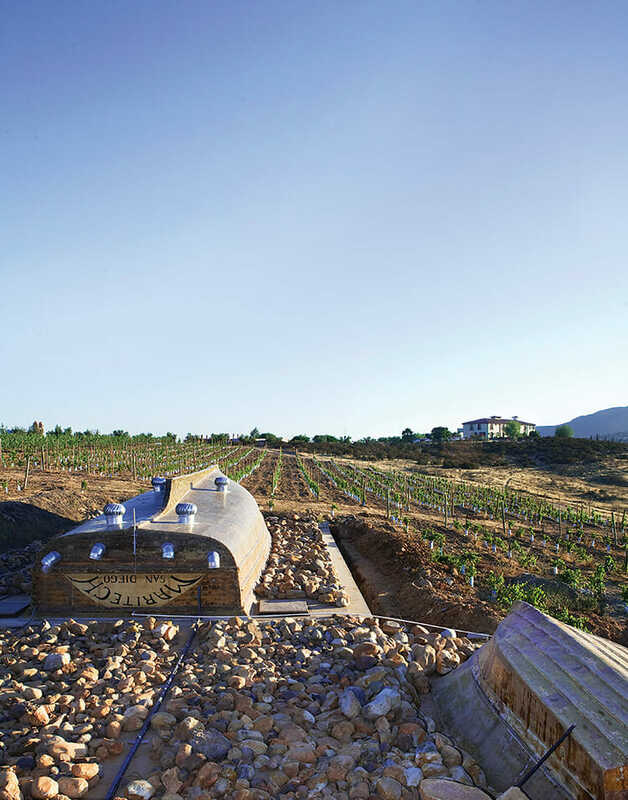 Just down the hill from CorazÁ³n de Tierra, beside a small lake, the Alejandro D’Acosta”“designed Vena Cava winery is built from the overturned hulls of antique wooden fishing boats. Originally from Manchester, England, the winery’s owner, Phil Gregory, is a former Los Angeles music producer, a skilled winemaker and generous host. The spiritual heart of the valley’s wine community is EstaciÁ³n de Oficios del Porvenir, a nonprofit winemaking school and cooperative known locally as La Escuelita. On top of being a training ground for amateur winemakers, the school has a communal olive press and a coffee roaster. The excellent on-site coffee counter, Azul Café, transports single-source beans from the coffee-growing regions of southern Mexico (beans are also available by the pound). 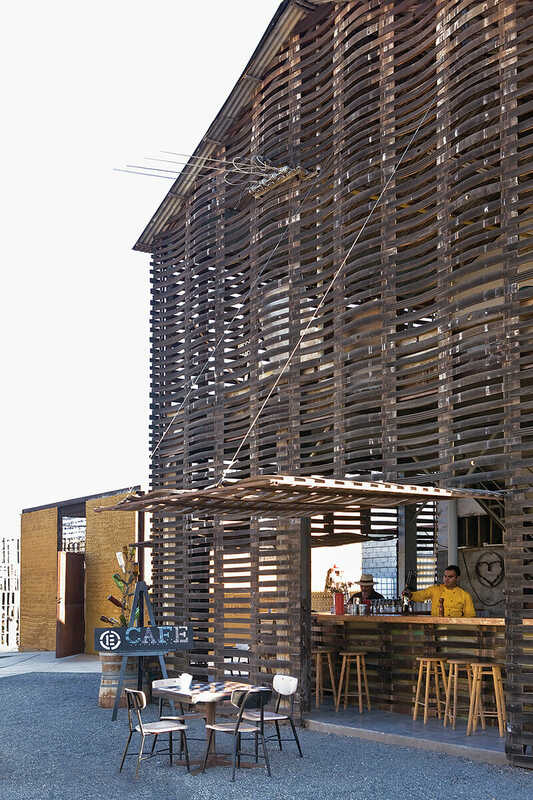 Azul Café's two-story wooden facade is made of deconstructed wine barrels. Two locals ride by La Escuelita, whose exterior is made of glass bottles, repurposed wine barrels and mattress springs. 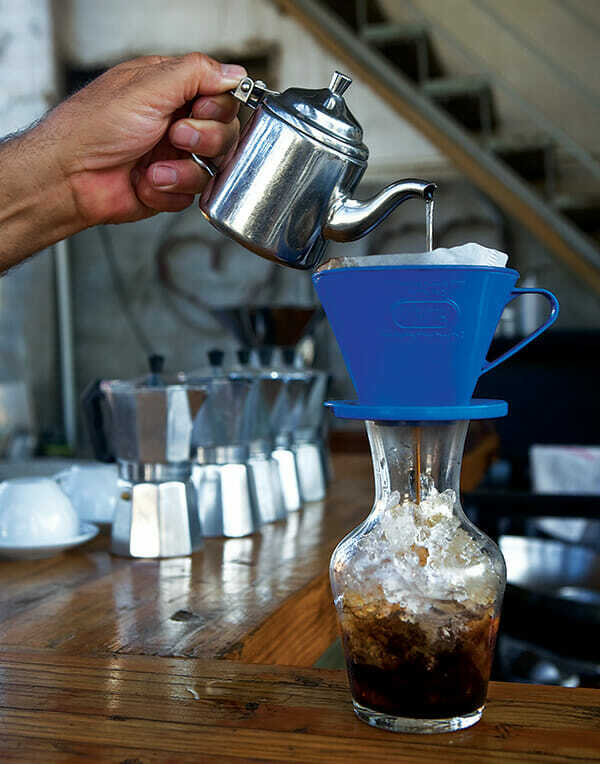 Café al hielo, or iced coffee, at Azul Café. 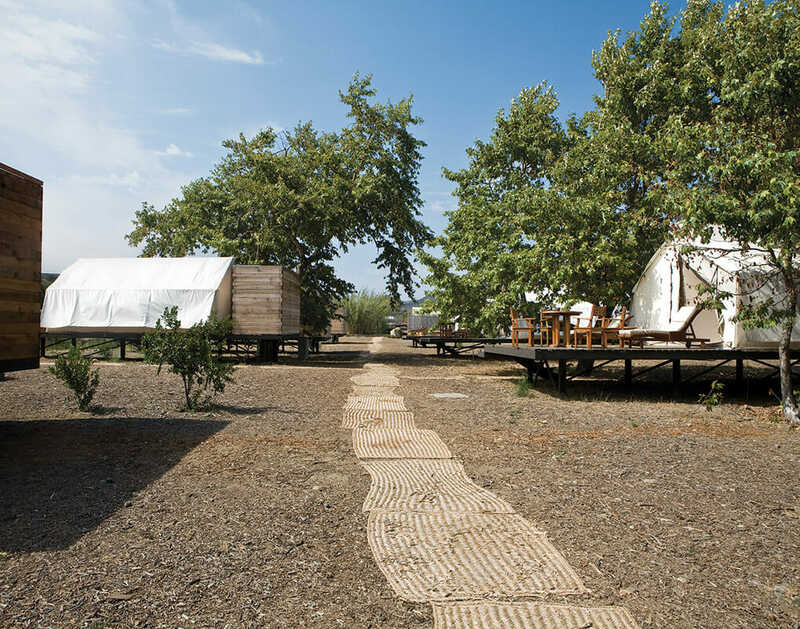 Handwoven bedrolls called petates lead the way to tent cabins at Cuatro Cuatros. 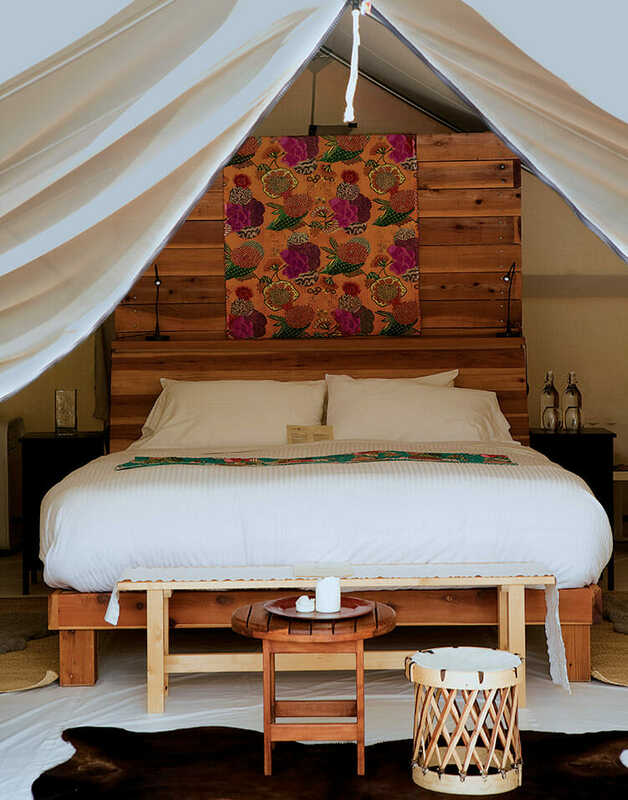 Built on wooden platforms, Cuatro Cuatros' cabins feature furnished patios, plush beds, cowhide rugs, running water and fireplaces. Boats serve as roofs for wine-tasting and aging rooms at La Villa del Valle. 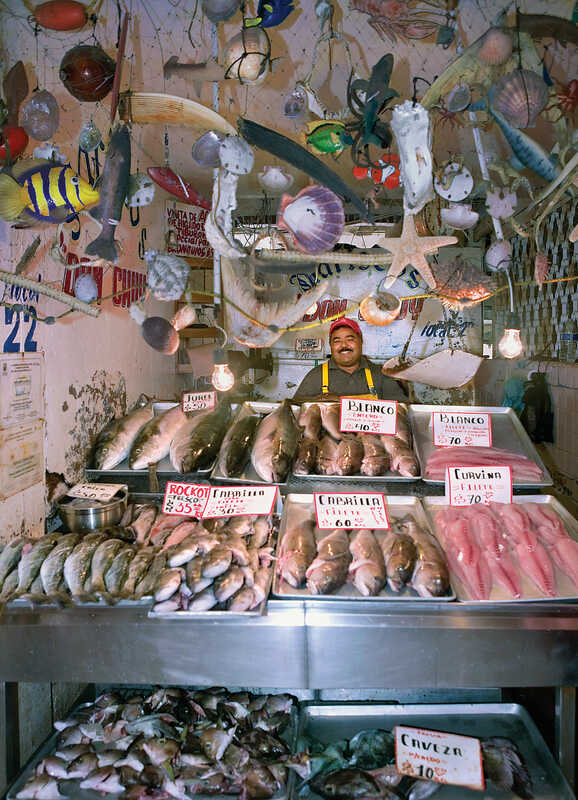 For a display of Baja’s aquatic bounty, stop by Ensenada’s seafood market, where tables are piled with ghostly white-bottomed flounder, giraffe-necked geoduck clams, sandal-sized Huarache oysters and well-preserved smoked marlin. Next, head to La Guerrerense, a street stall that sells 14 varieties of seafood tostadas, including sea urchin, black clam, sea cucumber and Guerrero-style (orange juice-marinated ceviche) – and a wide selection of house-made salsas with colorful labels. Last year, one of Tijuana’s most respected chefs, Javier Plascencia, opened a farm restaurant down an unpaved side road. The restaurant’s brick patio, shaded by a corrugated metal roof, is packed in the late afternoons, when the wine-tasting crowd settles in for a long meal overlooking the vines. A blackboard lists local ingredients, like tomatoes from Mogor Badan winery, where there’s a twice-weekly farmers market, and sea salt from San Felipe, on the Gulf of California. The wood-fueled grill gives a smoky depth to Pacific Rim-influenced dishes like grilled octopus with soy sauce, ginger and peanuts, while crawfish are brightened with an herbes de Provence”“like spice mix. Locally caught seafood for sale at Mercado de Mariscos. 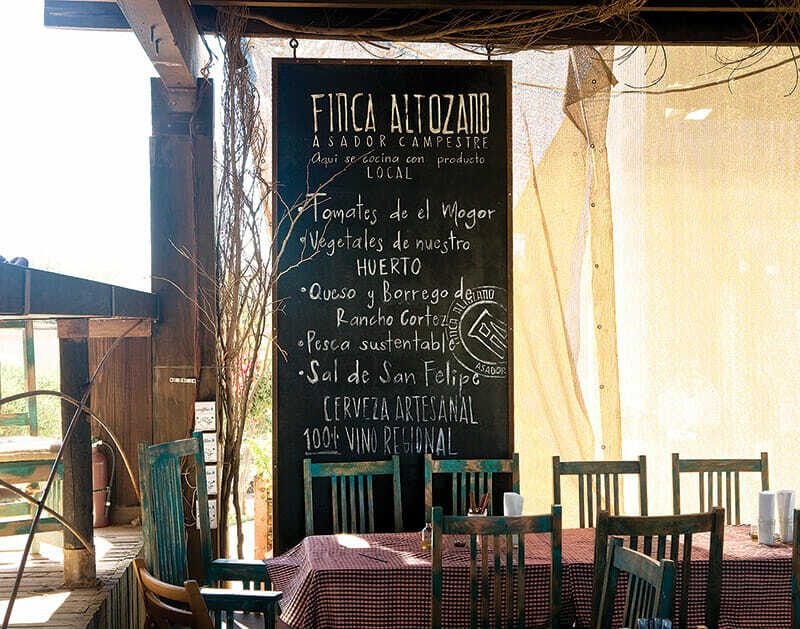 The casual Á la carte approach at Finca Altozano diverges from the valley's typical multicourse tasting menu. 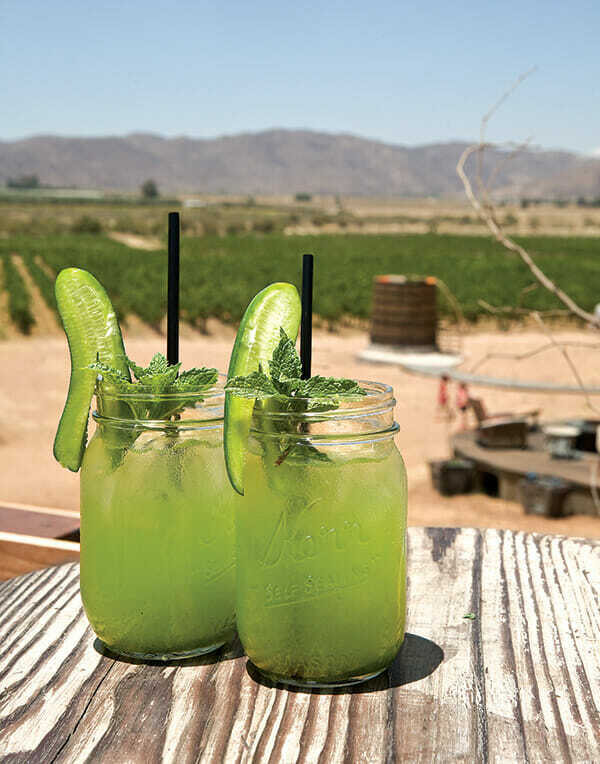 Finca Altozano's refreshing agua de pepino is made with local cucumber and mint from the restaurant garden. 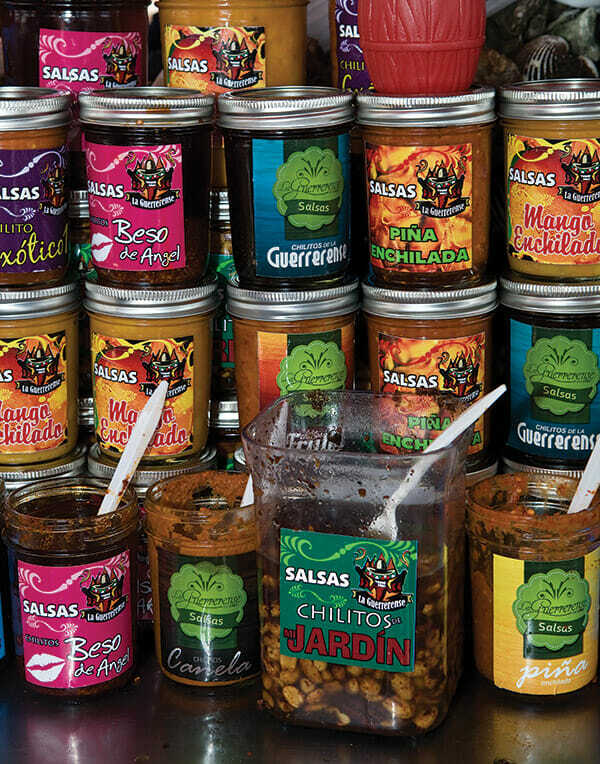 Ingredients in La Guerrerense's colorful salsas include whole peanuts and crushed chiles.